You would be hard pressed to find the E.G. The space you enter is simple and unassuming. Clean white walls, a few ties hanging here and there, bolts of silk and wool on shelves. The warmth of the place emanates from the owner, 57-year-old Patrizio Cappelli. He shakes your hand and makes you feel at home as soon as you arrive. The funny thing is, Patrizio might never have been here if not for taking a huge risk two decades ago. Patrizio Cappelli in his Naples store. But simply following a passion does not always lead to a successful business. The reason why Patrizio has thrived, the reason why the sartorially tuned-in seek out his ties wherever they are sold is his single-minded approach to quality fabrics and construction. The latter is done right in his store. Behind a green curtain on the lower level is a small workshop where five artisans follow a nine step process to make each tie. As Patrizio says, the skill required to assemble and perfectly close each tie, by hand, is like that of a bespoke tailor. The construction of his ties is something you can see and feel: the hand-sewn stitching running down the back; the self-tipped edging or, on the untipped, hand-rolled edges; the high-quality, two-type lining that is remarkably soft and pliant. Patrizio Cappelli in medallion wool challis tie. However, it is the outside, the fabrics and patterns that make Cappelli ties so sought after. 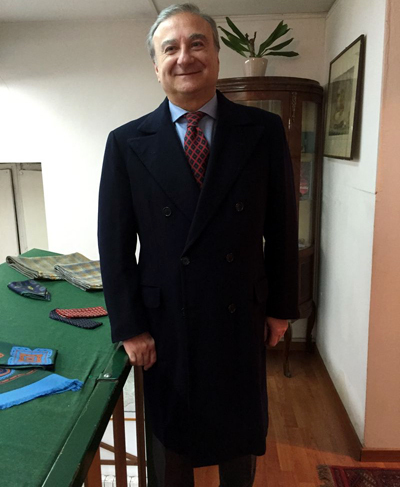 Patrizio makes numerous trips to fabric mills at home and abroad to procure exactly what he wants: silk twill, madder and wool challis from Britain, grenadine from Como, Italy. He works with the printers to achieve the kinds of unique patterns so associated with Cappelli ties. When searching for patterns and colours that are subtle, deep and rich Patrizio does not follow a formula but instead “I follow my heart.” He is also searching for fabric with the proper hand and look—silks that are not too shiny, wool that is soft yet firm. And these fabrics are perhaps the unheralded secret to Patrizio Cappelli’s success. Regardless of the tie – silk, wool, grenadine, self- or untipped – Cappelli’s neckwear is carefully crafted to have just the right heft to tie a perfect knot. And it is in the knot, after all, where the beauty of a tie rests. Patrizio understands that regardless of how you wear your tie, how nonchalant or perfectly presented, no matter the fabric or the pattern, the tie must make an excellent knot to most literally anchor it to your ensemble. 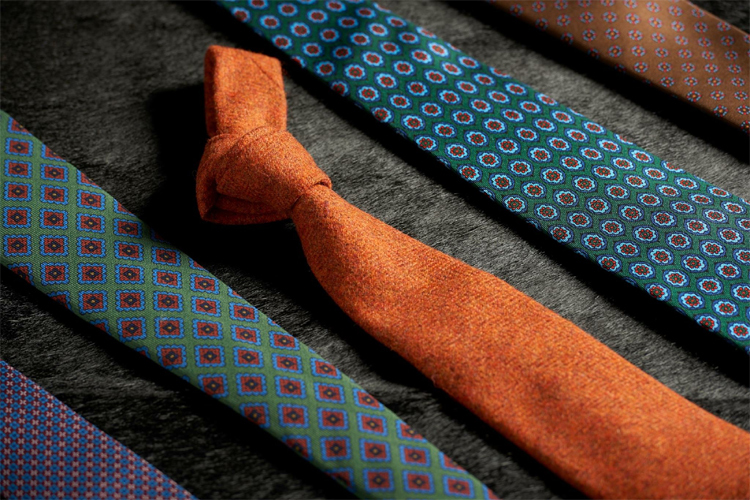 It is this combination of construction, fabric and pattern that make Cappelli ties so versatile. As you walk the streets of Naples, you will often see men wearing ties in more “casual” situations. And Cappelli ties are perfectly made to bridge the gap from tailored to casual. While many of the ties harmonize with a dark business suit, they are also just as comfortable with a sport coat, cardigan or even a safari jacket. Inspired? Follow the links below for a selection of our E.G. Cappelli ties or click here for the full collection.